From a child’s perspective, mirrors are mystical things that enable them to look into worlds as great as the ones they live in, but far more fascinating because they can only reach them in their imaginations. Fictitious or not, the characteristics that mirrors display in fairy tales, myths and legends are exactly the same as those we expect from our mirrors. I’d say that even as adults, the magic in the mirror doesn’t lessen or release its hold on our imaginations. Mirrors have the potential to empower us. As we look at ourselves, we can practice expressions we’ll use on important occasions we have coming up (come on – we’ve all done it!) For most of us though, the longest time spent in front of a mirror is during the process of getting washed and dressed in the morning, after which we return – sometimes begrudgingly – to the real world on our side of the mirror. The main magic to be found from our time in front of the mirror is that it allows us to go out and face the day feeling confident in ourselves, knowing we look the part. Could you leave the house without first checking your appearance in the mirror? Ignoring the magical connotations we’ve attached to mirrors, pretty much since the first person saw themselves in a puddle, mirrors are useful. There are places in our offices and houses where mirrors are both purposeful and visually pleasing. For example, it is hugely satisfying to enter or leave an office or house that has a large mirror in the reception or entry hall. Over the years probably millions of people have dodged multitudinous grave cases of hat-hair when arriving at parties using the well placed mirror in the hallway of their host’s house. In addition to this it can prove important to have a full length mirror in our bedroom or dressing room – countless mismatched outfits for women and horrendously garish bad shirt and tie combinations for men have been corrected before they make it out of our bedrooms thanks to dressing mirrors. As well as being a defence against poor clothing and hairstyle choices, mirrors are fantastic as spatial enhancers and can often be found in positions where they seem to double the size of rooms. They are also fantastic when it comes to adding extra light to rooms and placed intelligently can seem to increase insufficient amounts of windows. However, if we used mirrors solely for these practical purposes, they would only ever be found in positions and places of practicality, not to mention in practical designs – which, obviously, is not the case. With thousands of years’ of myths and magical properties attached to mirrors, it’s not a surprise that when we decorate, mirrors are such a prominent feature of so many homes, offices and hotels – everywhere really. They can be used copiously as purely decorative components in a room. Dotted about the place in an assortment of frame styles, shapes and sizes. They can be mounted high and low on the wall. They are a relentless reminder of the secrets that hide inside them. As a reflection of our world and lives, mirrors are genuinely magical and fascinating to the majority of us. With all these diversities in mind, at Mirrorworld, we know that choosing the right mirror for the right place can be a huge decision, with much deliberation over size and design. Even if you already know the look you’re after, the enormous number of possibilities can be alarming. So, over the next few weeks, we’re going to give you some tips that, hopefully, will help you to narrow the possibilities and choose the perfect mirror and perfect positions to use them, to match the rest of your interior design and the purpose you want it for. For those of us who like a bit of pomp and take style seriously; if you want your mirror to be as dazzling as your reflection, then Venetian glass mirrors are the perfect choice. Like your reflection, Venetian mirrors sparkle and amaze. They were first used as decorative pieces in ball rooms, drawing rooms and banquet halls rather than as looking glasses for bedrooms. The opulent, elegant frames were often etched, or smoked, with additional pieces of mirror layered onto them to add depth. This stunning example of a Venetian mirror from the 1870s has a bevelled mirror surrounded by an extravagantly carved and etched frame. Venetian mirrors tend to be built slowly, step by step. Each piece of glass, whether clear or coloured, that makes up the ostentatious structure is cut and shaped to the size required and then bevelled, polished and etched individually. Next, each piece of the glass has the silvering added, then finally, the pieces are assembled and fastened into position on a wooden frame. Venetian mirrors, with their beautiful etched glass frames and sense of drama, make the perfect complement to dining rooms, living rooms and hallways. 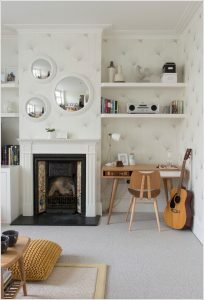 Creating a ‘mirror wall’ is a technique frequently used to produce the impression of space where it is lacking. The sitting space in this bedroom gives a good example of this system being displayed in an unusual and aesthetically pleasing way. 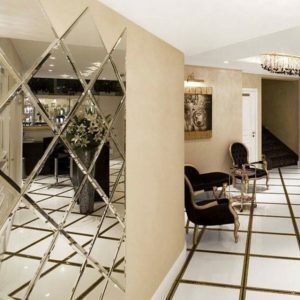 Instead of using just one large stretch of glass, the designers have used three framed mirrors on top of a patterned wallpaper which not only creates the illusion of added space, but also brings attention to the textures and layers of the room. 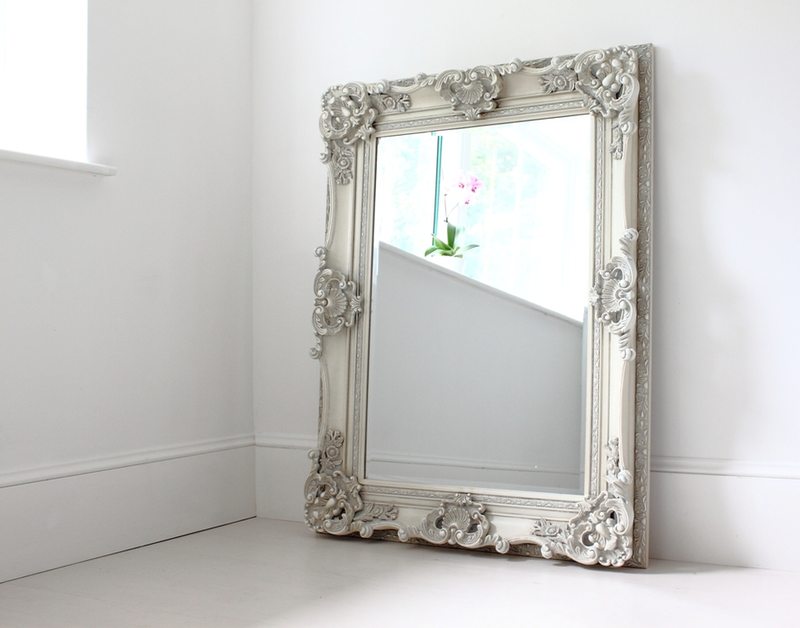 …and your mirror by hanging it vertically, or the ‘wrong way round’, over a sideboard or a console table. This arrangement, with the mirror perhaps opposite to the doorway to the next room, will elongate your room and also accentuate a room’s high ceiling and seem to add height to the walls in rooms with lower ceilings. One other benefit of hanging your mirror vertically, particularly for dining room mirrors, is that hanging your mirror vertically will make your reflection look considerably thinner than it would in a mirror that was hung in the more traditional horizontal fashion. If you ever happen to watch any old, black-and-white films, you may well see a living room or a boudoir with a mirror that bears this sort of design. Art Deco began, as with many things in the world of fashion and design, in France, shortly after the First World War. It became massively popular around the world during the 20s, 30s & 40s before going out of fashion after the Second World War. 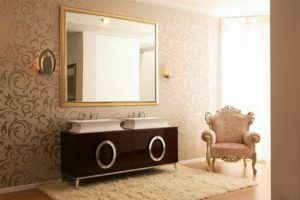 Still widely available, Art Deco mirrors can look clean and modern, and – depending on the design – slightly antiquated at the same time. They can appear particularly seemly when hung over fireplaces. Shiny Art Deco materials such as chrome, black glass, and blue mirrors, coupled with Art Deco’s characteristic rich colours, bold geometric shapes and lavish ornamentation can really add a sense of assertive beauty to your room. 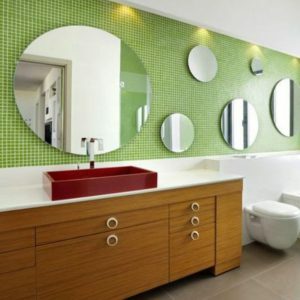 Many people are concerned that they will have to part with vast sums of money to put together a collection of cool and unique mirrors. This couldn’t be further from the truth. You don’t need to worry about the price to be able to concoct a truly amazing collection of interesting and unusual mirrors. 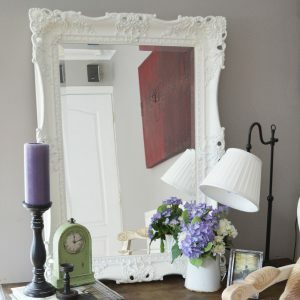 Some of the best places to find funky mirrors and frames can be small independent antique shops. Or places that provide made to measure services and will allow you to pick the size and shape of your mirror and the frame you want it in. 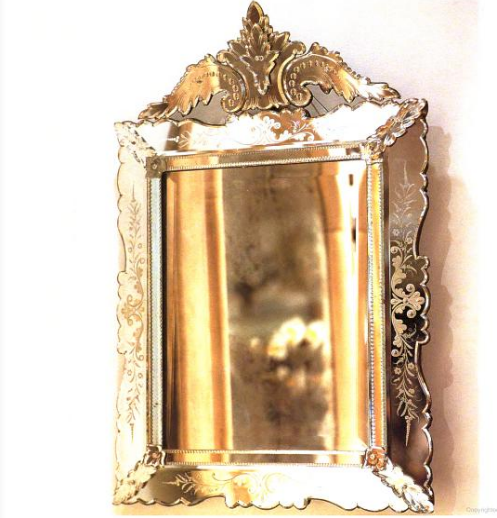 Unusual and interesting mirrors can be made in myriad styles, transcend periods in history and consist of a variety of materials. They could be antique mirrors, art deco mirrors or contemporary mirrors. As long as they have something unique about their shape, their glass, their frame, the material they’re made from, anything really. The great thing about unusual mirrors is just that; they are unusual. If you find the right one, nobody will have a mirror exactly the same as yours and everybody will want it. They look great in any size as well. You can use them as centrepieces in your living room or dining room, you can use them above the sideboard in your hall, put them in your bathroom, or have them in your bedroom as dressing mirrors – they will look great anywhere. Not only will they look great, the right mirror will command the space, demanding to be looked at. 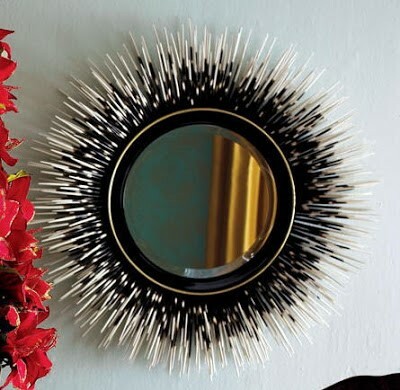 Unusual mirrors really have the potential to add the finishing touch to any room they’re used in. Using our award winning made to measure tool. You can create your very own unique mirror and have a piece that will draw the eye of any who see it, without the designer price tag. You’re often more likely to find a textured mirror in a commercial setting than a domestic one due to the fact that they often don’t reflect images as well as plain glass mirrors, if they do at all. However, many of these commercial and architectural mirrors can look stunning in a home if they are given sufficient opportunity. If you want to use your mirror purely decoratively and completely remove its natural functionality, try using a frosted or textured mirror. Although they don’t reflect images perfectly as a normal mirror will, they do impart a delicate incandescent effect to any setting they are in because, despite not reflecting images, they do reflect shadow and light. Textured glass can often have a lovely green opacity to its finish and frosted glass can be found in many different colours. Mirrors of this ilk can often look good as part of an ‘art wall’, they break up the visual assault that the rest of the artwork hanging around them can create if one isn’t careful. 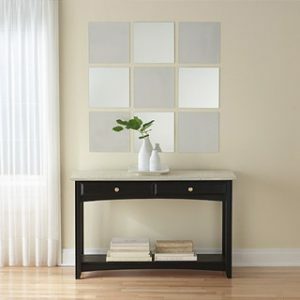 If these types of mirror are a bit too left-field for you, then another way you can add some originality to your home and mirror, but not remove the functionality of the mirror itself, is to use a leather or fabric frame. This will add some texture to your mirror and the design of your room, without removing the reflective quality of the mirror itself. Black leather will add something of a modern effect, whereas a worn brown will add a more antiquated look. Felts and velvets can also be used to soften particularly minimalist room designs. 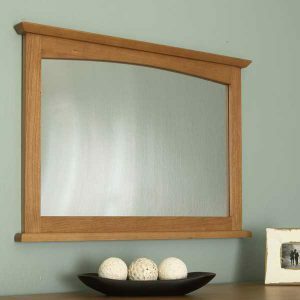 A mirror with a fabric frame will really bring a comfortable and homely feel to your room whilst still providing the impressive and beautiful centrepiece that will fit perfectly above a mantelpiece or parallel to your dining table. Why not give the gift of made to measure mirrors? Are you having trouble finding inspiration for Christmas gifts? Are the people you know awkward, or do you struggle coming up with original and thoughtful ideas? Consider a made to measure mirror from Mirror World. 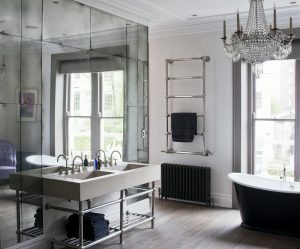 Personal, unique and practical, a bespoke mirror can be designed to suit your exact needs and requirements. 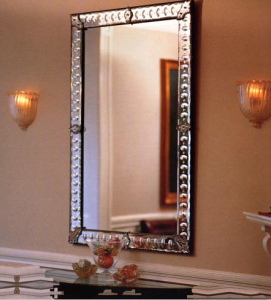 Mirrors are a beautiful and decorative way to add light to a room, and also give the feeling of extra space too. 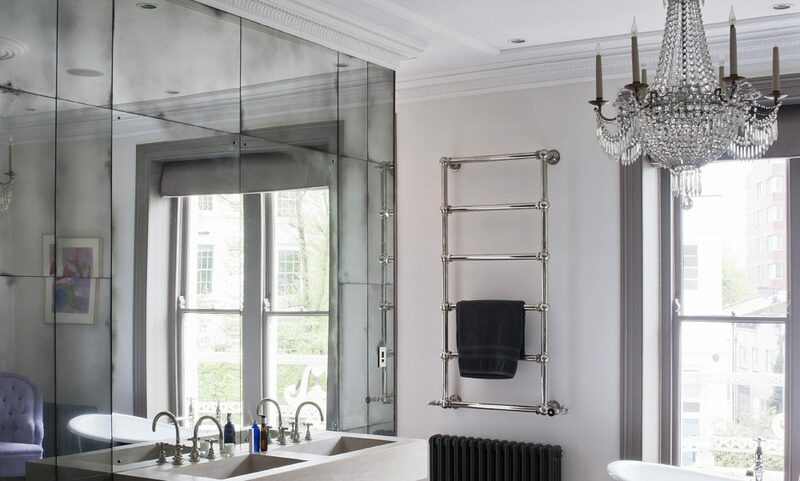 Made to measure mirrors can be made to suit any environment, whether it’s a living room, kitchen or bathroom. Our bespoke mirrors allow you to design every aspect of the mirror, from the shape and size of the glass to the material of the frame and the detailing on the mirror itself. Bespoke mirrors are an ideal and unusual gift which shows the amount of thought you have put into buying that certain person a present. Perfect if someone has recently moved into a new house and requires furniture, or for somebody who has an awkward space to fill on a wall. Our bespoke mirrors are tailored by you – we just build them! Of course, the price of our bespoke mirrors varies on the specifications, so made to measure mirrors can be designed to suit your budget too. While the wrapping of a mirror may be difficult, mirrors – made to measure are a gift which is sure to surprise and delight whoever receives it. 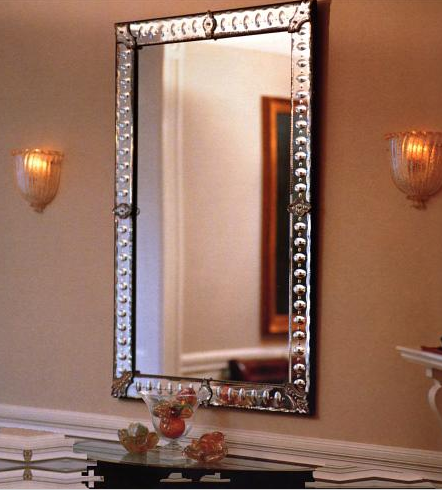 We take extra pride in our made to measure mirrors and strive to meet your exact requirements. 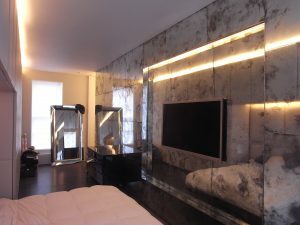 As a leading online supplier of mirrors for the UK, Mirror World are a company you can trust to provide top quality bespoke mirrors for any environment. So if you’re struggling for gift ideas this Christmas, whether it’s for your family or friends, choose a bespoke mirror from Mirror World to suit their home and put a smile on their face. If you listen carefully enough you’ll be able to hear them. 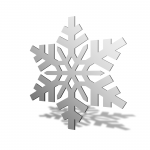 Moving, turning, the wheels are in motion, ideas screeching from underneath the friction of thought, looking for the answer to the question meandering through the nation’s minds – what gifts to buy for Christmas. Buying presents for friends and family is hard enough, but if you’re buying for friends who are a couple, it can be even trickier. Buying home appliances is too boring, his and hers items too personal and most other things either too tacky or too expensive. 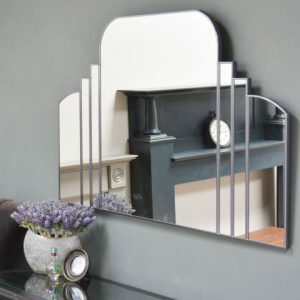 But there is something you can buy, something that’s sure to show you’ve thought about what you’ve bought, something that’s sure to benefit them both – and their house; a beautiful wall mirror. 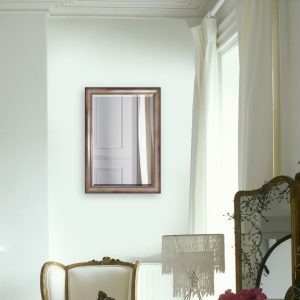 Now you’ve turned a corner, you know what you’re buying, but the finish line still isn’t in sight, you need to decide what kind of mirror you’re going to buy them. 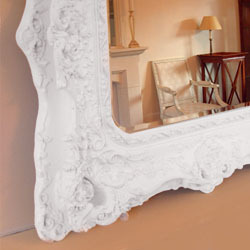 At Mirror World we provide a selection of fine mirrors sure to suit all different styles of home décor. For Christmas we recommend one of our antique mirrors, which come in glamorous designs, sure to impress any couple come December 25th. Our antique mirrors help to create a traditional, classic look for the walls of any home, effortlessly oozing style and sophistication to provide a fabulous feature for halls, bedrooms or living rooms. Antique mirrors are a stunning way to add elegance to a room and are sure to give your friend’s home a delightful dash of character. Alternatively, if you think your friends would prefer something slightly different to traditional antique mirrors, we highly recommend overmantle mirrors. Sitting above the fire place, they’re the ideal finishing touch for living rooms, adding a cosy touch and adding extra space – they make terrific use of light and really open up an area. Our collection of antique and overmantle mirrors are built by highly skilled British craftsmen, taking influence from Victorian, French and traditional styles, made from wood, with beautiful coating options of gold and silver leaf. So there you have it, you’ve reached the finish line and found something ideal, mirrors, a superb gift idea for your friends. Don’t hesitate to browse through the full collection on our website or contact our team to discuss your requirements. Our Novelty Mirrors Make An Ideal Christmas Gift! Christmas can be a difficult time, particularly if you’ve got a lot of people to buy presents for. Typical gifts often include toiletries, gadgets and clothes, but what do you buy someone if you want to provide a thoughtful, practical gift? Novelty Mirrors! Usually children are inundated with hordes of toys on Christmas day, some of which by summer time will be a distant memory. It seems a bit of a waste of money to give someone a gift which won’t be used in 6 months time. So why not consider a novelty mirror. 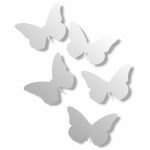 Here at Mirror World, we stock a huge selection of novelty mirrors which are perfect for children’s rooms. Not only do they make a stylish and attractive feature that the child will love, they’ll also last for years to come! 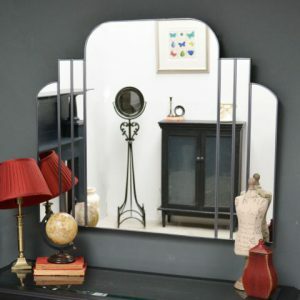 With an array of shapes to choose from, we are confident that you’ll be able to find the perfect children’s mirror for the child who has everything. Whether they’re a lover of dinosaurs, vehicles, fairies or stars, Mirror World have the perfect mirror for any child. Mirrors are effectively a toy of their own, as children can spend hours in front of a mirror pulling funny faces and creating effects. A mirror is a wonderful embellishment for any wall; our children’s mirrors are fun, different and add a real touch of character to a child’s bedroom. Our novelty mirrors are available in a wide range of fun shapes; grabbing the attention of any child and creating a wonderful resemblance to their favourite things, for example, a pony, tractor or flower. Little girls will love our princess mirrors, complete with pink detailing on the crown. For little boys, you could be really creative and create a whole mirrored scene on the wall, using a combination of our skull and crossbone mirror, whale shaped design and of course, our pirate novelty mirrors. 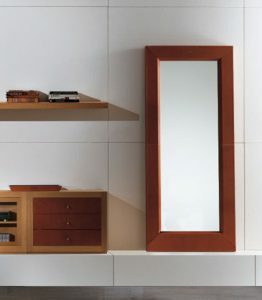 Mirrors really do make great gift ideas, and offer a personal, practical touch which makes for an ideal gift. So what are you waiting for? Take a look at our novelty and children’s mirrors now. Though don’t take too long over choosing a design; you’ll have to order soon if you want it to arrive in time for Christmas!